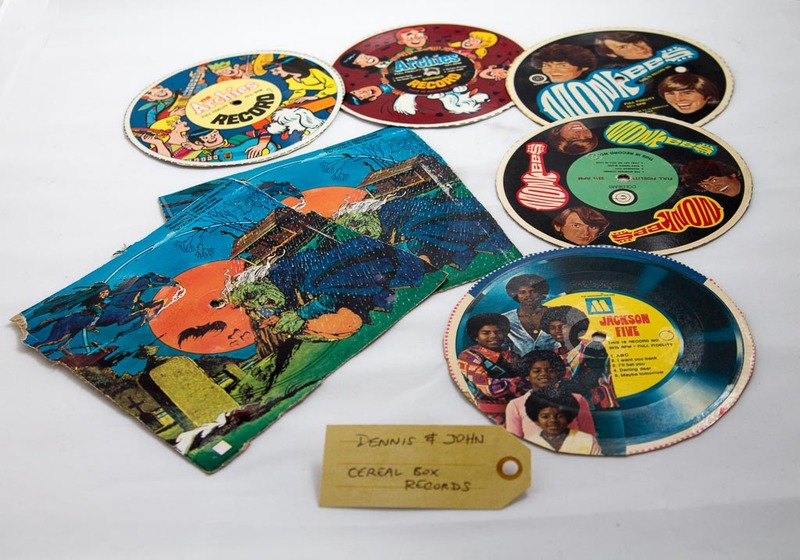 Cereal box record albums | That Belongs in a Museum! In this particular record box I’ve got a particular kind of record [cereal box records]. We’ve got selections from the Archies, The Jackson Five…the Monkees…spooky records, The Legend of Sleepy Hollow. Our holiday favorites from WGN were actually released on 45s, and until we had VCRs and you actually caught it when it was on Ray Rayner, or Bozo or wherever one of these things used to get shown, you couldn’t see them unless you had these [holiday cereal box records] that you could play at your whim. This is Hardrock, Coco, and Joe and Suzy Snowflake.